European commissioner for consumers Vera Jourova said authorities "will finally get teeth to punish the cheaters". The EU on Wednesday unveiled rules to bolster European consumer protections by ensuring "tougher fines" for cheating companies and stronger legal ways to compensate victims. The European Commission proposed a "new deal" for consumers following the Volkswagen "dieselgate" scandal where the bloc's consumers, unlike those in the United States, have not been compensated. But the 28-nation European Union executive said the rules will not usher in US-style lawsuits across the bloc. 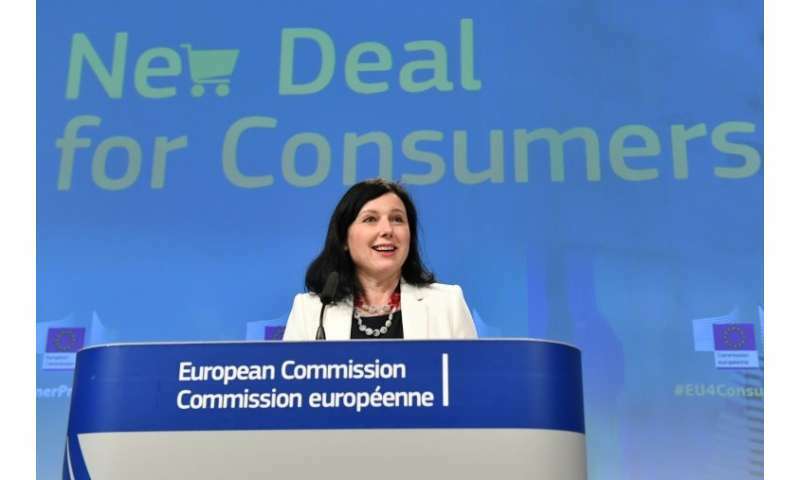 "In a globalised world where the big companies have a huge advantage over individual consumers we need to level the odds," EU commissioner for consumers Vera Jourova said. "With stronger sanctions linked to the annual turnover of a company, consumer authorities will finally get teeth to punish the cheaters," Jourova said. "It cannot be cheap to cheat." Commission Vice President Frans Timmermans warned traders will face "tougher fines" if they abuse trust and said consumers will have a right to collective redress. The move to provide stronger protections for consumers came as part of a broader effort to boost public support for the European project following a rise in anti-EU populist sentiment and Britain's vote to leave the bloc. Markus Beyrer, director of the BusinessEurope lobby, called the new proposals unnecessary, arguing Europeans enjoyed "the strongest consumer protection" in the world. Monique Goyens, head of the European consumer organisation BEUC, welcomed them because consumers will be able to claim compensation collectively in some cases. But BEUC feared member states may have too much discretion to determine which cases are chosen. Under rules still to be approved by the European Parliament and the member states, online consumers will be informed clearly if they are buying products or services from a company or a private person. Online consumers will also be informed when a search result is being paid for by a trader. The rules would also ensure free digital services when consumers offer personal data, such as for cloud storage services, social media or email accounts. Consumer or other qualified organisations will be able in all member states to seek compensation, replacement or repair on behalf of a group of consumers harmed. Such collective action currently exists only in some member states. Unlike US-style class action lawsuits, European cases will not be open to profit-seeking law firms and restricted to consumer organisations and other non-profit groups that fulfil strict criteria. The proposed rules will ensure consumers in all member states—not just in some—can seek financial compensation or end contracts if they face aggressive or misleading marketing. Under the proposal, national consumer authorities can impose penalties in a coordinated way. If consumers are harmed across the bloc, the trader will face a maximum fine of four percent of annual turnover in each member state. Member states can also impose higher maximum fines. Unlike in the United States, the European Union struggled to punish Volkswagen for emissions cheating that erupted in 2015 and ensure customers were compensated. In a separate consumer-related development, the commission unveiled plans to boost people's trust in scientific studies to ensure the food they eat is safe. Under the proposals, European citizens will have immediate access to scientific studies supporting applications for approval of products affecting food safety. The move was sparked by massive citizen and environmentalist opposition to the EU's renewal for five years of the weedkiller glyphosate over fears it could cause cancer. Critics claimed that US agro-giant Monsanto, which introduced in 1974 the brand-name Roundup containing glyphosate, unduly influenced research into the weedkiller's safety.